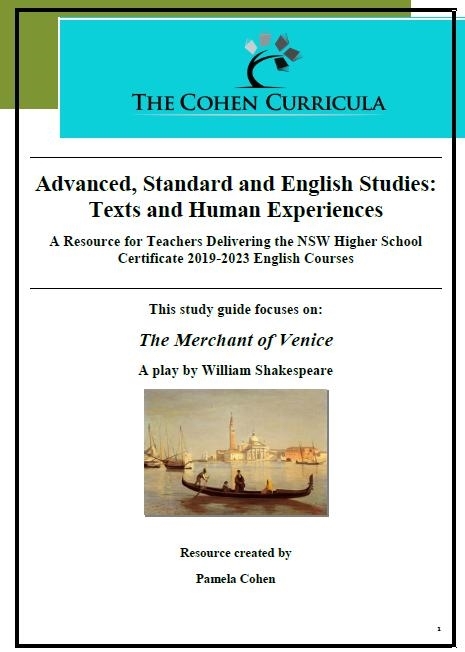 The Cohen Curricula Teacher Resource for the new common module 'Texts and Human Experiences' focuses on The Merchant of Venice by William Shakespeare. The resource provides you with a complete teaching program, workshops and worksheets. The resource contains hyperlinks to the syllabus outcomes and rubrics. All workshops and worksheets, including a study of dramatic and language techniques, audience, purpose, context, themes, issues, ideas and values are provided. 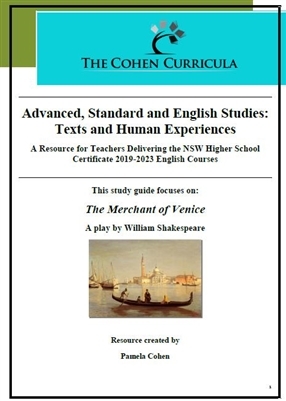 Analysis is provided for each act and scene relating them directly to the 'Texts and Human Experiences' module. A detailed annotated breakdown of the language of the syllabus and of dramatic techniques is provided. This is a thorough resource for use by teachers in the classroom. Copyright © The Cohen Curricula. All Rights Reserved.